Ride atop Slinky Dog from the Disney•Pixar Toy Story movies as he chases his tail around a giant food bowl. Slinky Dog Is Ready for a Run! Spring into action for a fun-filled spin in the heart of Toy Story Land. Andy, the boy from the Disney•Pixar Toy Story films, was having fun with his good old pal Slinky Dog, the pooch with a Slinky® spring for a body. Even though Andy’s now away, Slinky Dog still wants to play—he just loves to run around in circles chasing his own tail. Stroll past oversized Lincoln Logs and Woody’s Roundup playing cards and make your way inside a colorful board game box. Receive a temporary “Barking Pass” and then—when the signal is given by Mr. Potato Head, Rex and Hamm from a speaker overhead—climb aboard an eager Slinky Dog and prepare for your rollicking ride. Take off around a giant dog bowl filled with colorful chew toys as Slinky Dog barks excitedly, eagerly trying to catch up to his own tail. Scamper up and glide down—again and again—as you follow a ring-shaped path, the wind racing across your face during the wild chase. 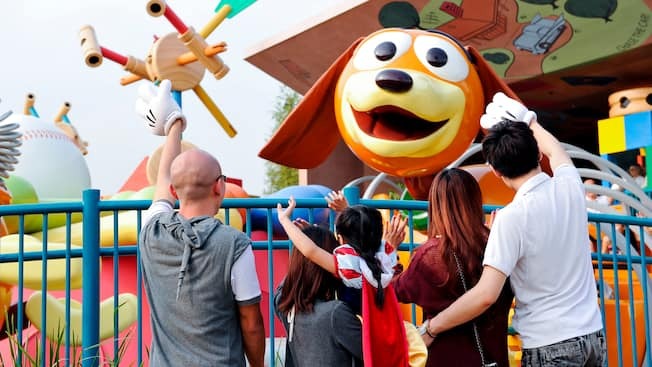 Hold on tight and howl with laughter as Slinky Dog picks up speed during your rousing ride, and enjoy the sights and sounds of Toy Story Land as they whiz by in the not-too-far-off distance. Offering tons of doggone fun, Slinky Dog Spin is sure to keep everybody’s tail wagging with delight! !